Fried chicken? YES! Wait for it? NO! Normally, you’d be right. 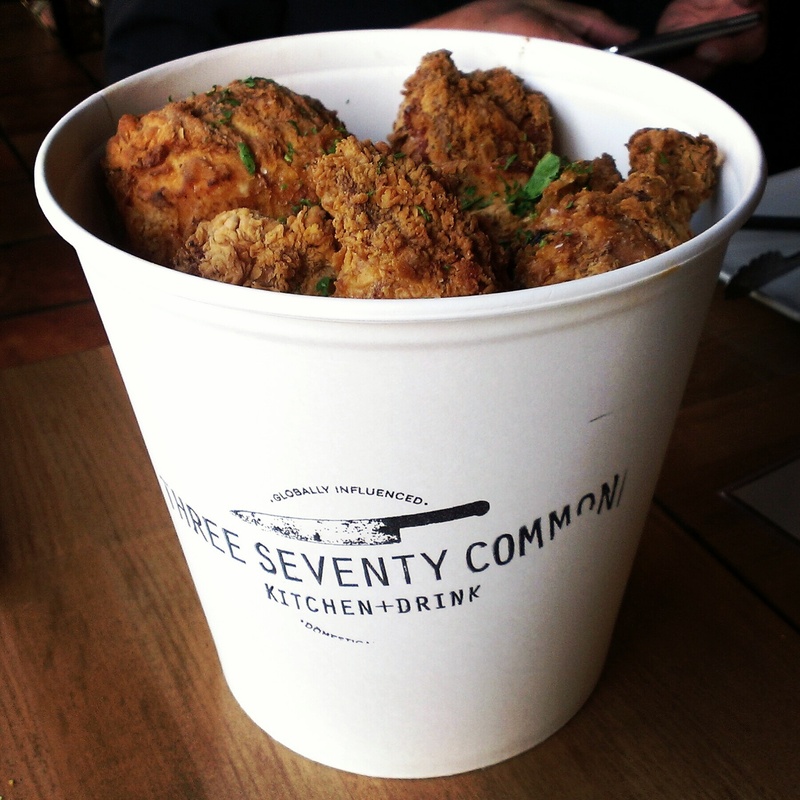 No one wants to wait for fried chicken when that crunchy juicy salty chicken-y craving hits but trust me, 370 Common’s fried chicken is worth that wait. Wait? Why do I need to wait for it, you ask? Well, it’s only available on the last Sunday of the month, at 370’s prix fixe only, Sunday Social dinners. Chef Ryan Adams started his Sunday Social family style dinners about 2 years ago and they been a very popular dining experience with locals and visitors ever since. Each Sunday, Chef Ryan offers a 5-7 course prix fixe meal served family style, meaning every dish comes as one big plate and everyone passes it around to serve themselves, just like you did as child around the dinner table on Sundays. Chef Ryan sources most of his vegetables from the local farmers market so the side dishes change with the seasons but the fried chicken is always on that last Sunday’s menu. First up on this occasion, the Cucumber Tomato Salad was fresh with herbs, a bright zip from the vinaigrette and silky from the avocados’ buttery nature. The crunch from the cucumbers (hidden under the arugula) and radish lent a nice contrast in textures along with the mini crunches of the toasted bread crumbs. 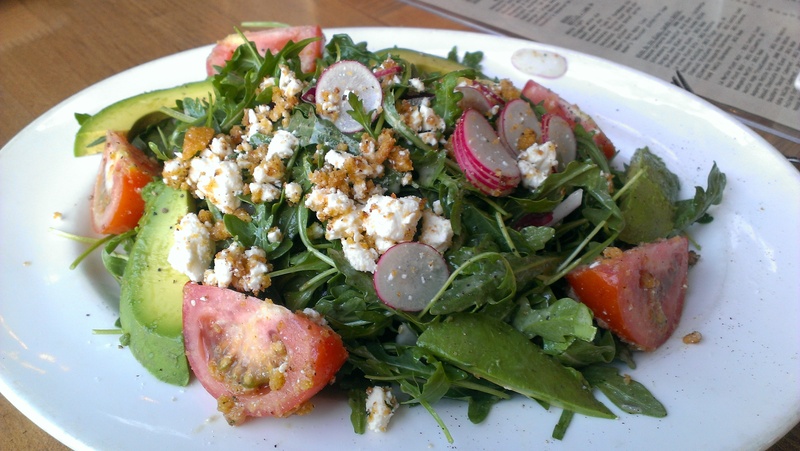 To top it all off with a personal favorite, crumbled goat cheese, made me a very happy eater. It’s hard to describe this dinner surprise as it wasn’t listed on the menu but all I can say is a resounding WOW. 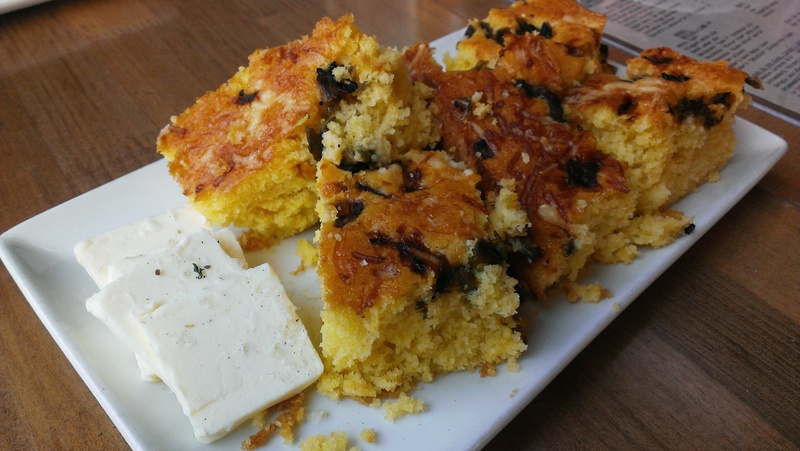 Corn Bread like you’ve never had it before. It was so light, fluffy almost and incredibly tender and moist. The caramelized onions sprinkled over the top before baking, so they’d sink into the corn bread crust, just added to the bread’s gentle sweetness. Maldon Salt with fresh ground pepper & herbs sprinkled over the butter pats secured my love for this corn bread. 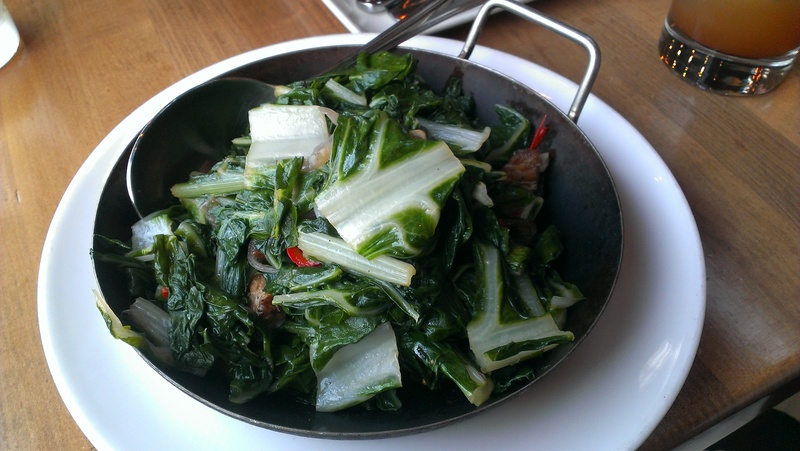 Pork Belly Braised Greens…that pretty much says it all. Greens are greens to me, I generally enjoy them as much as the next guy, but braise them in a little pork fat from the belly (fresh un-cured bacon, if you’re not sure what that is), toss in some chiles for a little spicy kick and you had me at…well, pork belly. 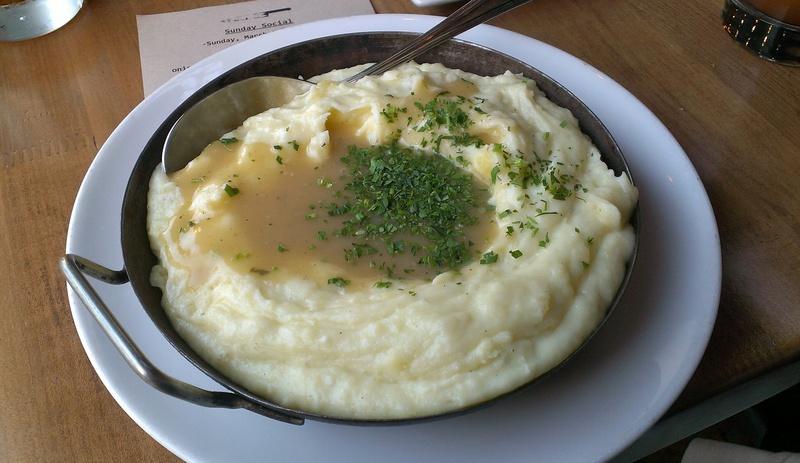 Green beans and mashed potatoes have always been a huge part of the sunday dinners my mom used to make and these at 370 Common elevate the classic dishes to the next level. 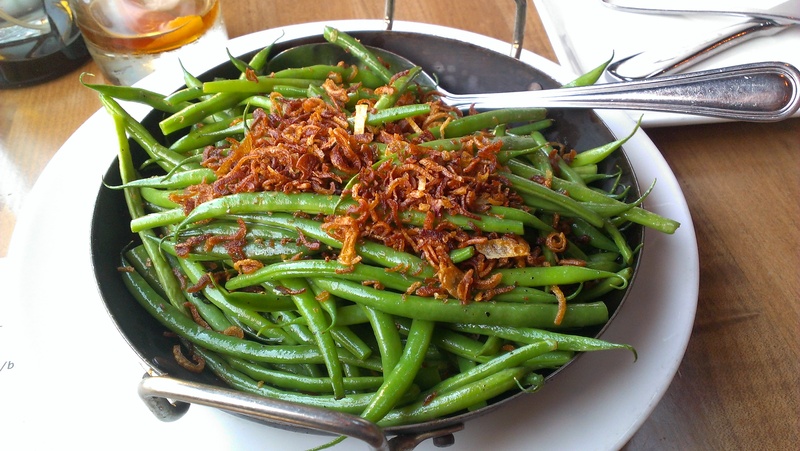 The Green Beans with Crispy Garlic & Shallots are perfectly cooked to retain a gentle snap while the Garlic Mashed Potatoes & Gravy are the best classic rendition you’ll have tasted. The gravy is rich & deep in flavor from the chicken stock made in-house. We scraped that serving dish clean. Here is what you’ve been waiting all this time for (has it been a month already? ), FRIED CHICKEN!! And damn good fried chicken at that. 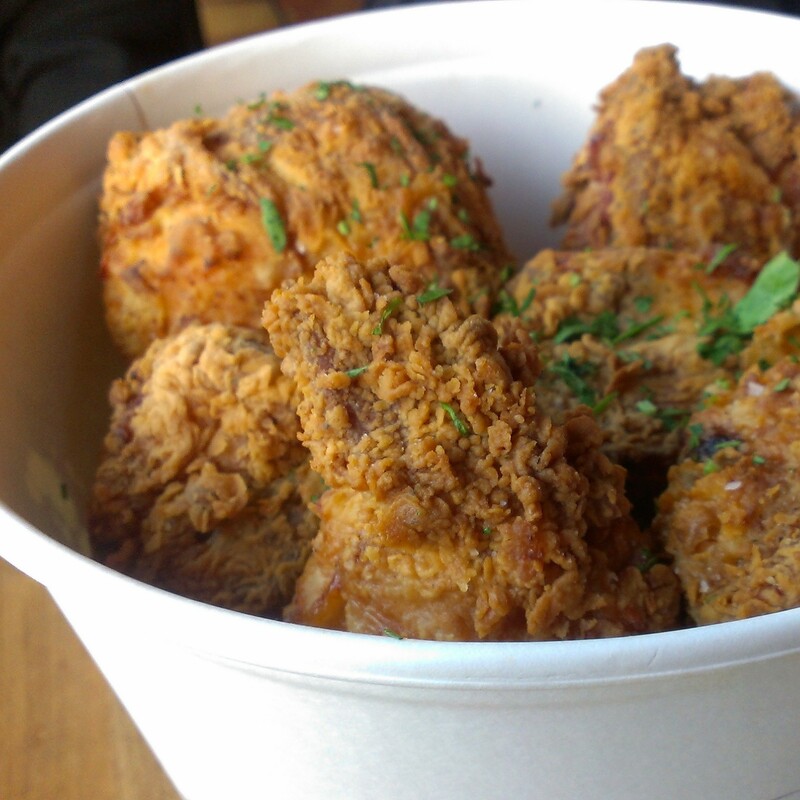 It’s perfectly crispy, perfectly juicy, perfectly tender, perfectly season and well, it’s just perfect fried chicken. I tried to get Chef Ryan’s secret seasonings and technique out of him, but he wouldn’t budge at my pleading. How fun though, that it comes to the table served in a paper bucket, an ode to KFC perhaps, that helps solidify the feeling that you are at home with family, eating a comforting meal. 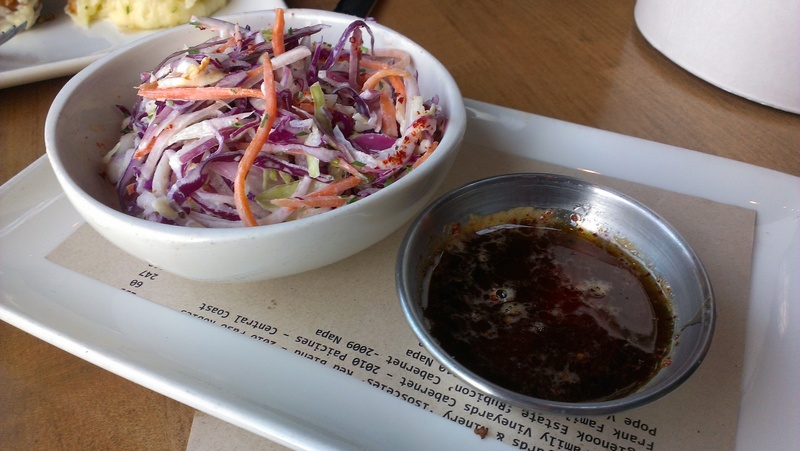 The fried chicken is served with a side of slaw, nicely crunchy and mildly sweet along with a ramekin of spicy honey for dipping your chicken in. Originally, it was served drizzled over the fried chicken but is now on the side for those who prefer their fried chicken without, as I do. Good call Chef. As if I’m not already stuffed and very very happy about it, out comes dessert. 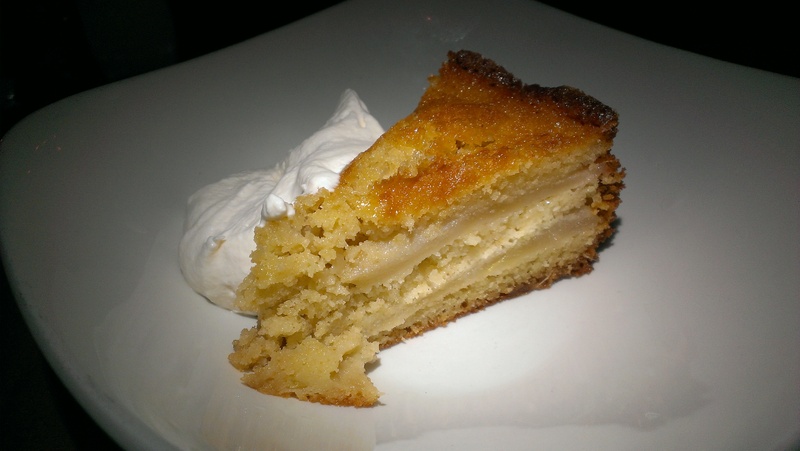 The Ginger Pear Cake is a beautiful dish to end the meal. It wasn’t too sweet, almost gooey moist, with the toasted top giving an enjoyably tensive chew. The zing of the ginger was gentle enough to not overpower the mild tasting pears. This is the one dish that did not come “family style” though if it had, I would have cut myself a huge piece. Chef Ryan used to offer his fried chicken just every once in a while, it was quite random. You had to have signed up for the 370 Common newsletter (be sure that you do ASAP) to know when it would be on the Sunday Social Supper menu. I thank him for listening to his diners who clamored for it more frequently, so now every last Sunday of the month it is, bravo! It truly is worth the wait.